In the late 1890’s the American theatre began to centralize. New York became the unchallenged theatrical capital of the country, with a population large enough to support unprecedented long runs. Financial control passed from actor/managers and directors to businessmen, who consolidated the nation’s playhouses. Star actors who wished to appear in major theatres had to sign exclusively with this "Syndicate," as it was eventually called. Successful new plays were held in tight control and performed regionally only in chain owned venues. This sounded the death knell for the grand old "stock companies." John Ellsler’s company in Cleveland went under. The Boston Museum closed after fifty years. And in New York, Daly’s company disbanded. What took its place came to be known as "Broadway" theatre. Some stars resisted, Maurice Barrymore raged publicly against this centralization and descended into madness. Minnie Maddern Fiske continued her career as an independent actor/manager. But despite her position as America’s most popular actress, she was never allowed to appear in first class playhouses. Audiences would flock to see their beloved Mrs. Fiske in converted skating rinks and town halls. Her husband, Harrison Grey Fiske published the New York Dramatic Mirror as a weekly theatrical magazine, and as an organ of protest against this take-over of an art form by business interests. Joseph Haworth had no such conflicts. Future Syndicate czar Charles Frohman had produced Sue, during which he and Joe enjoyed a cordial and mutually beneficial relationship. Indeed, Joe’s career flourished in the new commercial, "Broadway" environment. In November 1898, still exhausted from the Park Theatre season, Joe took over the title role in Hall Caine’s The Christian at the Garden Theatre in New York City. The play was an established success that eventually transferred to the Knickerbocker Theatre for a total run of 160 performances. Joe played the complex and conflicted hero John Storm, a man born into nobility and raised as a moral relativist. The plot had Storm become an idealistic young clergyman in central London. The conflict was played out between Storm and the greedy, godless property owners’ desire to demolish his church in order to enlarge their music hall. Receiving star billing was Viola Allen, Joe’s co-star from the McCullough years. As Glory Quayle, Miss Allen brilliantly walked a fine line between innocence and decadence. Joe’s performance as John Storm was a sensation. He aroused audiences with the role in a way that his predecessor, Edward J. Morgan, never did. The publicity mill ground furiously during this time. Joe received awards from various religious organizations, and added to his costume an antique silver cross that had been worn by Pope Pius IX, a gift from a local New York priest. There also was considerable newspaper coverage when he abruptly left the play in February 1899, citing exhaustion from overwork. Three weeks later, he again made the front pages when The Windsor Hotel burned on March 17, 1899. Joe had stayed there that winter during the run of The Christian and was in the hotel shortly before the devastating fire started. News reports went out that he had perished. When he turned up safe and sound in Atlantic City, his family, friends and admirers drew a collective sigh of relief. Joe then signed with producer Jacob Litt. Beginning with the ownership of Milwaukee’s Bijou Theatre, Litt had build a theatrical empire in the Midwest. He acquired and managed other theatres, and produced touring productions of The Sporting Life, In Old Kentucky, East Lynne, and Bronson Howard’s Shenandoah. Litt wanted to establish himself as a major New York producer, and in May of 1899 he used an elaborate revival of Shenandoah as his vehicle. Joe was cast in the leading role of Kerchival West, a part created by Maurice Barrymore ten years earlier. Litt’s New York assistant was young Milwaukeean William Wood, who wrote home to his family in April 1899: "New York is beginning to look like a real battleground. The Shenandoah pictures are all over the place. The show will open on May 1st with Joseph Haworth in the leading role. He was the leading man in The Christian and is a splendid actor and an immense favorite down here." The production was huge. It played the Broadway Theatre, and the May 2, 1899 New York Times stated: "The view of the vast expanse of the Shenandoah valley was exceedingly effective, while the incidents of the battle of Cedar Creek, the advance of the Union troops, and their retreat, with their artillery under a galling fire, and the reawakening of courage with the arrival of Sheridan, were presented with much elaboration of pictorial detail. Many horses and many men were employed, and a large quantity of gun powder was burned." Joe’s work was well reviewed, although the New York Dramatic Mirror noted: "Joseph Haworth in the role of Colonel Kerchival West was virile and effective at all times, and gave a notably fine performance, though the role did not give full scope to his ability." Joe was the cover boy for the May 13th issue of the New York Dramatic Mirror, with this accompanying text: "Joseph Haworth, whose latest portrait is reproduced upon the first page of this issue of THE MIRROR, has just scored another notable triumph by his superb performance as Colonel Kerchival West in Jacob Litt’s revival of Shenandoah at the Broadway Theatre. Following close upon his notable work as John Storm in The Christian, Mr. Haworth has accomplished the uncommonly difficult task of following other admirable players in two especially difficult roles, both in New York in a single season, and achieving in each an unqualified success." After the customary summer hiatus, Joe was back in New York in another Jacob Litt production. This time the vehicle was The Ghetto, a Dutch play that had enjoyed a run of 300 performances in Amsterdam. Litt’s New York production was a moderate success at the Broadway Theatre. Joe played Raphael, a young Jew whose marriage to a Christian girl disrupted his relationship with his orthodox father. It should be noted that Joe was now 45 years old and still able to successfully play juvenile roles. Although theatrical convention at the time allowed this, and Joe’s effects were aided by hair pieces, make-up, and a bit of corseting, it is still to his credit that he was able to pull it off so well. On Saturday, September 15, 1899, William Winter wrote in the New York Herald: "Whatever defects there are in The Ghetto, and they are not lacking, it works up to a stirring climax at the end of the third act. The scene is well developed, gathers up all the threads of the story, and holds them at one point as a climax should. Rebecca, Aaron’s daughter, who loves Raphael and is mad with jealousy because she suspects his passion for Rosa, the Christian serving maid in his father’s house, has cried out her suspicions to the Ghetto. Its enraged denizens pursue Raphael to the steps of the synagogue, where, at bay, he, in mockery of the dowry that goes with Rebecca, puts up his heart at auction. At last Rosa, pushing her way through the surging crowd, brings him her love --- heart for heart, soul for soul --- and he, seizing her in his arms, exultingly faces the mob. "Joseph Haworth, who acted Raphael, the hero of the story, made a telling effect of this climax, and after the curtain fell the audience ‘let itself go’ in a fashion that is new to Broadway houses, for above the applause there were shrill whistles from the gallery." "The dramatic version of Henry Sienckiewicz’s Quo Vadis received its initial production at McVicker’s Theatre this evening. Monday night was originally set for the performance, but the elaborateness of the staging demanded further rehearsal, and the play was postponed until to-night. "The dramatization is by Stanislaus Stange and follows the main incidents of the book closely. The scenery, by D. Frank Dodge of New York, received a large share of the applause. "Vinicius, Joseph Haworth; Petronius, Arthur Forrest; Nero, Edmund Lyons; Ursus, Elmer Grandin; Lygia, Roselle Knott; Eunice, Maude Fealy. The play held the interest of the audience from the start, and there were numerous curtain calls. "The incidental music was composed by Julian Edwards, the choral numbers and dances in accord with the period which Quo Vadis covers. "The advance sale of tickets broke the record at McVickers." After engagements in Chicago, St. Louis, Washington, and other cities, Quo Vadis opened at the New York Theatre on April 9,1900, but under unusual circumstances. A rival adaptation premiered at the Herald Square Theatre on the very same night. Critics and audiences preferred Joe’s production. 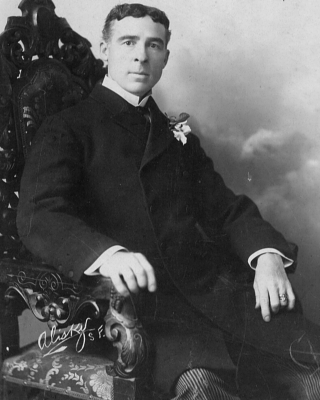 The April 14, 1900 New York Dramatic Mirror stated: "Joseph Haworth, of course, made a splendidly picturesque, finely oratorical Vinicius and acted with his ever admirable force and spirit." As Quo Vadis settled in for a long run, images of Joe as Vinicius flooded New York. A special edition of the novel was published featuring photographs of the production. The faithful saw Joe as an embodiment of New Testament virtue, and he gave interviews reinforcing this image. However, as the weeks went on Joe began to feel his customary restlessness. He could play Hamlet or Macbeth ad infinitum, but after a certain number of repetitions in popular melodrama, he wanted out. In May, management asked the Quo Vadis acting company to agree to a 10% pay reduction, in order the finance the air conditioning of the theatre during an extended summer’s run. Nearly all of the company agreed to this, but Joe refused and handed in his notice. At the same time, he gave a press release stating that he was entering vaudeville on the Proctor circuit. At this time, many legitimate actors were making the move to vaudeville, and were getting paid generously to perform in one act plays. However, by the end of the month, the dispute was resolved with Joe retaining his guaranteed salary and continuing with the production through the end of the season. Clearly Joe knew his own value, and would not be cheated or exploited. "I doubt whether any sermon ever preached, or in the most intense revivalistic services ever enacted, have so charmed, uplifted and spiritually awakened an audience as did your pathetic description of the meeting of the Christians. As for myself, it held me spellbound and caused me for a time to feel that, instead of being at the theatre, I was listening to the hallowed strains of religious melody. I do not believe that the stage possesses another man that could play your part more effectively, insomuch as you combine intelligence with profound religious emotion. "You display the sweet sincerity of religious earnestness without any of the gloom of pessimism, which so often attaches to it. I had seen you often before, but I do not recall any performance in which you seemed to be so perfectly adapted to the part, and in which you have drawn a character apparently so well stamped with your own personality." The likelihood is that despite his promiscuity and bouts with alcoholism, Joe did have a deep religious faith. An Irish Catholic single mother raised him. When his brother William married, his bride Sarah Graham had to convert to Catholicism under the tutelage of the Paulist Fathers. But Joe never married. The American Biographical Dictionary stated that Joe had an "unrequited attachment" to Effie Ellsler, his first Ophelia. Whether Miss Ellsler was the only love of his life or not, Joe remained a life-long bachelor with a strong heterosexual libido. Perhaps his attributed fits of depression were the result of religious guilt over sins of the flesh. Whatever was the true state of Joe’s conscience, at Quo Vadis’ first Saturday matinee in June, autographed likenesses of him as Vinicius were handed out as though they were holy pictures. There is no power can push me from my throne." Walk barefoot, till my guilty soul be shriven." The play had all the elements of a Joseph Haworth vehicle: language, epic structure, period settings, and a plot of sin and redemption. It opened in Worcester, Mass. on November 29, 1900. Audiences responded to Joe’s work with typical enthusiasm. Reports of its success immediately appeared in the New York press, and producer Alfred Aarons announced a Broadway engagement for the play. On January 26, 1901, the New York Times reported that Robert of Sicily would open at the Herald Square Theatre on March 4. But three weeks later, the deal fell through and the New York run was cancelled. Joe’s disappointment was profound. He had put his heart, soul, and personal fortune into the play, and would continue to try to get it produced in the years to come. Just as King Robert tumbled temporarily from his lofty throne, the vicissitudes of commercial theatre had brought Joe momentarily low. In the fall of 1901 Joe’s spirits got a huge boost when he returned to San Francisco to star with the Grand Opera House stock company. He was held over week after week, playing Richelieu, Quo Vadis, The Merchant of Venice, Hamlet, Rosedale, and William Haworth’s adaptation of Dr. Jeykll and Mr. Hyde. Of his Hamlet, the San Francisco Call wrote: "It was fresh, vigorous, human, giving plain reflection of the motives underlying every word and deed of the melancholy Prince. By readings as clear as a cloudless sky it plucked the mystery out of the passages which the students variously interpret. However daft the Dane may have seemed to Polonius or Gertrude, he was as sane and plain to his audience as an open volume." The year 1902 began with efforts to bring another starring vehicle to Broadway. The play was Coriathon, based on a tragic story found in the book of Mormon. It was written by Arestes U. Bean, a son of George Bean, who was Indian interpreter for Brigham Young. Wealthy Mormon capitalists backed the enterprise, although the play was in no sense propaganda. Set in South America seventy-five years before Christ, it told of the Aztec Prophet Amla’s chastisement of his wicked son Coriathon over his infatuation for the scarlet woman Zoan-ze-Isabel. Because of Joe’s involvement, theatrical managers throughout the country were interested in the production. It played to huge business in Salt Lake City in August. Joe was a member of the Elks, and a national convention coincided with the play’s premiere. Subsequently however, a scandal involving Utah’s Senator Smoot caused ministers to rail from the pulpit against anything Mormon, and Coriathon was dropped like a hot potato. "I would like to see you this week as I am off for a few weeks and I am anxious to see Mr. Mansfield play Brutus. I asked Gregory to present my name for Cassius at first production but we were doing so well with Coriathon the Mormon drama that I thought I was all right. Now that the "Smoot" matter is up before the nation (Senator from Utah) and ecclesiastics are all up in arms against anything Mormon, although the play is as thoroughly Christian as Quo Vadis, Ben Hur, or The Christian – I have written Mr. Mansfield. I thought he might send a Mansfield production of Caesar out with me. He seems to be the only artist who has the sand to do the works of the master. I am looking for a manager – something I have never had yet. I have always been successful in the classic drama but always lacked management. A year ago I played Richelieu, Quo Vadis - Shylock – Hamlet and Jekyll Hyde and Rosedale in San Francisco and the press was universally enthusiastic. I played six weeks. I like that work and think I excel in it – Hope I may see and talk with Mr. Mansfield and yourself. I am building a new country home in Willoughby just for your company – unless something more whole some offers." The "Mr. Mansfield" Joe referred to was Richard Mansfield, then the biggest male star in America. Mansfield was on tour in a spectacular revival of Julius Caesar, preparing for a New York opening in December 1902. Mansfield was undertaking the part of Brutus, and it was a challenge for him. Basically a tricky and theatrical actor who dazzled audiences with his virtuosity, Mansfield was struggling to find the thoughtful and internal Brutus. When he heard of Joe’s interest and availability, he fired the actor playing Cassius and engaged Joe to assume the role. Literally over night, Joe joined the company and played the newly opened Colonial Theatre in Boston. Joe’s presence uplifted the whole production, and the famous "tent" scene quarrel between Brutus and Cassius became the highlight of the evening. Mansfield spent most of the tent scene sitting in the dark, while Joe’s Cassius held forth with astonishing energy and intensity. Mansfield finally took stage with an enormous vocal blast on the line "Away, slight man!" The critics didn’t unanimously agree that it was in Brutus’ character, but agreed that it was Mansfield’s best moment in the production. Julius Caesar opened at the Herald Square Theatre on December 1, 1902. The press reception was generally favorable, with great praise going to the spectacular production. Mansfield’s reviews were mixed. In the New York Herald William Winter wrote: "His conception of the character of Brutus – that he was a man half crazed by brooding over the growing power of Caesar and the increasing danger therefore to the republic – perhaps explains to some extent his exaggeration of gesture and the startling ghastly "make up’ of his face…Mr. Mansfield is first and foremost a character actor. To bring out and show the full advantage all that is in him, the role he enacts must have in it something of eccentricity, something outré, something outward, as well as inward, that differentiates, that sets it apart from the ordinary mortal." Of Joe’s performance Winter wrote: "Mr. Joseph Haworth as Cassius fully realized the ‘lean and hungry’ plotter whom Caesar feared. His part in the quarrel scene was splendidly played." The January 1903 issue of Theatre Magazine went further: "Joseph Haworth’s Cassius was a notable performance. The attributes of this fine character – nobility of purpose, dauntless courage, iron will, tremendous vitality – Mr. Haworth was an embodiment of them all. The impassioned fervor of his speech and action, his splendid diction, added to a fine classical physique, made up an impression that will dwell in the memory." Julius Caesar ran fifty performances at the Herald Square Theatre. The production set a never-bettered record for the play on Broadway, and brought Joe back with a bang. Popular opinion was that his superior classical technique made Cassius the central character of the play, for all of Mansfield’s bag of tricks. Ordinarily a snobbish player who looked down on his fellow actors, Mansfield held Joe in great esteem and treated him with the deference due a fellow star. He was most anxious for Joe to remain in the company when it resumed touring. But Joe left the production following its Broadway closing, in order to take on the role of a lifetime. When Count Leo Tolstoy wrote his novel Resurrection, he gave it to the world, reserving no copyright. It was therefore dramatized in many different versions and countries. The only authorized adaptation was by Henri Bataille in Paris. In January 1903, Oscar Hammerstein I announced that he was going to produce Michael Morton’s English translation of the Bataille adaptation at the Victoria Theatre. Blanche Walsh and Joseph Haworth were announced for the leading roles of Katusha Maslova and Prince Dimitri Neckhludoff. The role of Prince Dimitri afforded Joe the opportunity to express the full breadth of his talent and to act in the naturalistic style of the Moscow Art Theatre, where Resurrection first played. There were forty-nine speaking parts in the production, but the characters of Dimitri and Maslova alone ran through the entire action, the other characters passing behind the two leading roles like a psychological panorama. The play told of young Prince Dimitri’s impetuous seduction of a serving girl before leaving for military service. Tolstoy’s plot had their paths cross again in a courtroom years later, with Dimitri a juror and the girl, now a prostitute, accused of murder. The action then focused on Dimitri’s efforts to redeem her life, and thus atone. Joe was able to play the charming but irresponsible youth in the first part of the play, and then show the character’s growth into mature regret and accountability. As Maslova, Blanche Walsh went from ingenuous innocence to a harrowing portrait of abandoned and wretched humanity. In the February 18, 1903 New York Herald, William Winter wrote: "In all these scenes Miss Walsh or Mr. Haworth was the dominating figure. They had much to do and they did it well. Mr. Haworth was effective alike in his utterance and in his reticence. He expressed strong emotion without contortions. "The scene in the jury room, after the verdict had been rendered, was especially moving and true to nature. It was a fine presentation of a robust nature shaken to the depths by sorrow, shame and remorse, but preserving masculine mastery over its expression." A separate review in the same paper stated: "Joseph Haworth’s interpretation of Prince Dimitri marks him as a great actor." Of his opening night performance, News of the Theatres wrote: "As Prince Dimitri, he swept all before him and gave one of the few very great performances of the year. His magnificent work that night – and old stagers who had watched his work for a quarter of a century said that he had surpassed himself – was a resurrection in more senses than one. It made New York playgoers realize for one thing how rarely nowadays a great actor is heard or seen." After an eighty-eight-performance run, Resurrection closed on April 30, 1903. A fall tour and a return New York engagement were in the works as Joe went home to Willoughby for his summer’s rest. In mid-August, he traveled with his sister Kate to Crestline to spend the week with his brother William. Returning on Sunday August 28, 1903, he fell ill and was unable to reach his home two miles away. He was taken to the Kingsley Hotel in Willoughby and confined to bed. At 7:00 pm, a carriage was ordered to take him home but he was too weak to leave his bed. An hour later, his sister Kate came into his room to check on him, and found that he had died. Joe was gone at the age of forty-eight. His passing was front-page news across the country. His death was attributed to heart failure from over-exertion. Joe was mourned and widely eulogized. The Boston Herald said in part: "As it was he grasped every opportunity to appear in the classic drama, and it is not too much to say that he was successful in every classic role that he undertook. He was a man of unusually broad mental attainments, a master of the mechanics of acting, and in temperament a thorough artist. By his death the stage loses a disciple that can be ill spared." But perhaps, William Winter said most simply and succinctly: "Haworth, who had been taught by McCullough, possessed rare ability, pursued his art with ceaseless, glowing fervor, accomplished much, but died in the morning of his fame."